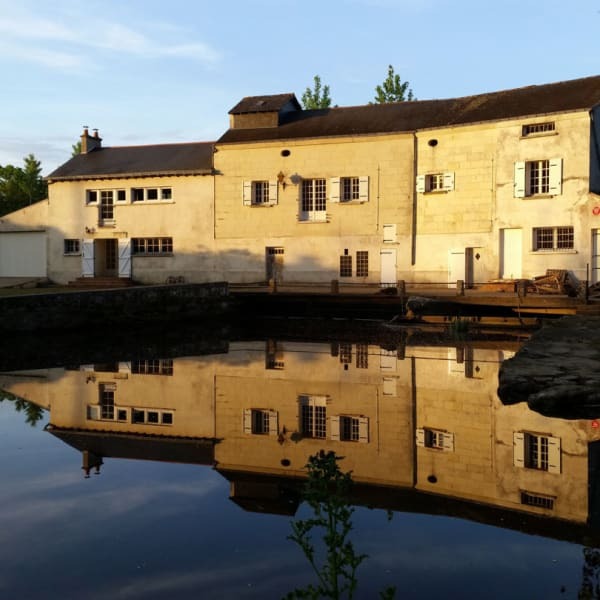 We are renovating our water mill and have a bunk/dorm for the cost-concious traveller or those who prefer to share! We can accommodate up to 10. Accommodation consists of a bed in a shared room, with light and power socket for essential phone/laptop charging! Guests provide their own linen/sleeping bag/ etc. or we have a linen pack (sheets, quilt, pillow, pillow case) available at extra charge. We also have double, twin and triple rooms available all with private bathroom/shower room. We are on a river and so in the summer months swimming is possible in the adjacent natural pool. The hardy could also swim in the winter too! Canoeing/kayak is also possible in the spring/early summer. We are a non-smoking property (that includes hanging out of the window! )- as its mostly build of wood! And for the comfort of all out guests! Those who wish to are welcome to do so outside or maybe take a short walk to the neolithic bridge! We have a dalmador - she is very shy and wont approach you until she is certain you are a friend! There is so much to see/do in this area. It is particularly popular with cyclists and those with interests in wine as we are surrounded by cycle routes and vineyards! The Loire valley is famous for its châteaux several of which are within easy reach by bike or car.